The NASA/ESA Hubble Space Telescope is providing astronomers with extraordinary views of comet 73P/Schwassmann-Wachmann 3 as it disintegrates before our eyes. Recent Hubble images have uncovered many more fragments than have been reported by ground-based observers. These observations provide an unprecedented opportunity to study the demise of a comet nucleus. Amateur and professional astronomers around the world have been tracking the spectacular disintegration of 73P/Schwassmann-Wachmann 3 for years. As it plummets towards a close encounter with the Sun, swinging round the Sun on 7 June and heading away to begin another loop round the Solar System, the comet will pass the Earth on 12 May, at a distance of 11.7 million kilometres, or 30 times the distance between Earth and the Moon. The comet currently comprises a chain of over 33 separate fragments, named alphabetically, and stretching across several degrees on the sky (the Sun and Moon each have an apparent diameter of about 1/2 a degree). Ground-based observers have noted dramatic brightening events associated with some of the fragments indicating that they are continuing to break up and that some may disappear altogether. Hubble caught two of the fragments, B and G, shortly after major outbursts in activity. The resulting images reveal that an amazing process of hierarchical destruction is taking place, in which the larger fragments are continuing to break up into smaller chunks. Several dozen "mini-fragments" are to be found trailing behind each main fragment, probably associated with the ejection of house-sized chunks of surface material that can only be detected in these very high-resolution Hubble images. Sequential Hubble images of the B fragment, taken a few days apart, suggest that the chunks are pushed down the tail by outgassing from the icy, sunward-facing surfaces of the chunks, much like space-walking astronauts are propelled by their jetpacks. The smaller chunks have the lowest mass, and so are accelerated away from the parent nucleus faster than the larger chunks. Some of the chunks seem to dissipate completely over the course of several days. One of the European team members, Philippe Lamy from Laboratoire d'Astrophysique de Marseille, France, says "When we observed the comet in late 2001 we concluded that many small, by then invisible, fragments had to be created by fragmentation to account for the missing mass. The new Hubble observations beautifully confirm and illustrate our past findings." Cometary nuclei are deep-frozen relics of the early Solar System, consisting of porous and fragile mixes of dust and ices. They can be broken up by many different mechanisms: be ripped apart by gravitational tidal forces when they pass near large bodies (for example, Comet Shoemaker-Levy 9 was torn to pieces when it skirted near Jupiter in 1992, before plunging into Jupiter's atmosphere a year later), fly apart as the nucleus rotates rapidly, crumble under thermal stresses as they pass near the Sun, or pop apart explosively like corks from champagne bottles as trapped volatile gases burst out. "Catastrophic breakups may be the ultimate fate of most comets," says planetary astronomer Hal Weaver of the Johns Hopkins University Applied Physics Laboratory, who led the international team that made the recent Hubble observations and who used Hubble previously to study the fragmentations of comets Shoemaker-Levy 9 in 1993-1994, Hyakutake in 1996, and 1999 S4 (LINEAR) in 2000. 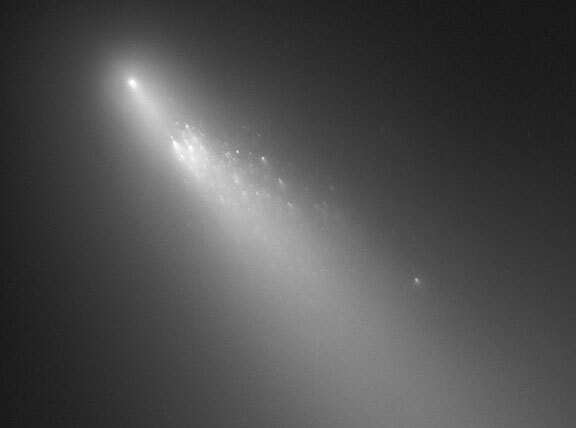 Analysis of the new Hubble data, and data taken by other observatories as the comet approaches the Earth and Sun, may reveal which of these breakup mechanisms are contributing to the disintegration of 73P/Schwassmann-Wachmann 3. German astronomers Arnold Schwassmann and Arno Arthur Wachmann discovered this comet during a photographic search for asteroids in 1930, when the comet passed within 9.3 million kilometres of the Earth (only 24 times the Earth-Moon distance). The comet orbits the Sun every 5.4 years, but it was not seen again until 1979. The comet was missed again in 1985 but has been observed at every return since then. During the autumn of 1995, the comet had a huge outburst in activity and shortly afterwards four separate nuclei were identified and labelled "A", "B", "C", and "D", with "C" being the largest and the presumed principal remnant of the original nucleus. Only the C and B fragments were definitively observed during the next return, possibly because of the poor geometry of the 2000-2001 apparition. The much better observing circumstances during this year's return may be partly responsible for the detection of so many new fragments, but it is also likely that the disintegration of the comet is now accelerating. Whether any of the many fragments will survive the trip around the Sun remains to be seen.